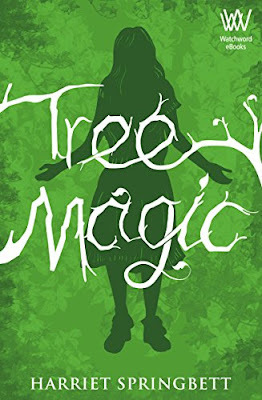 My review today is for Tree Magic, the debut young adult novel by Harriet Springbett, published on 9th January 2017 by Watchword eBooks, the digital-first imprint of Impress Books. Tree Magic is Rainbow’s story. Rainbow is a troubled teenager with a slightly unconventional family life, who is different to her peers and doesn’t quite fit in; who then discovers her hands can communicate with trees. I connected with Rainbow from the start and was intrigued by the journey (or journeys) her life takes following the discovery of her gift. There were two words that kept coming to my mind as I was reading this book, one was emotion and the other was unexpected. This book is full of emotions. I could feel what Rainbow was feeling when I was reading it and all the anger, frustration and hatred that I felt as an emotional teenager came flooding back to me. Rainbow’s life is unexpected; like the direction of a leaf caught swirling in a gust of wind, I had no idea where this book would take Rainbow next. Each twist and turn led to her discovering something new about her gift, her past or her future and I needed to carry on reading to find out where she would find herself next. From the UK countryside to rural France to Paris, everywhere the book goes is brought to life through the strong, vibrant and different characters we meet. I loved this book as an adult and know it would have struck a chord as a teenager. I would have loved to have read it thirty years ago. Like Rainbow’s connection with the trees I felt the author connected with me as the reader, meaning the spiritual side, which plays an important part in this book, felt natural. Harriet is a local author who I first met a few years ago when we both attended the Charroux Literary Festival. I was delighted to discover that this summer she will be running a session there. It is always exciting to know someone in person who publishes their first novel and I was delighted to be offered a review copy, but with it came the added pressure; what if I didn’t like it? However, I needn’t have worried as from the very beginning I was hooked. Tree Magic, published by Impress Books, is available in ebook format. I think this is a book that will be enjoyed by both young and older adult readers.